With the release of every new study examining federal employee compensation comes different numbers and familiar arguments. But a recent report from the Cato Institute’s “Downsizing the Federal Government” project describes, by far, the largest pay and compensation gap yet between public and private sector workers. Federal employees earned 80 percent more in 2016 compared to private sector workers, according to Chris Edwards, director of tax policy studies at Cato. Federal employees earn 42 percent more than state and local government workers, he added. Edwards used Bureau of Economic Analysis data to compare average wages and benefits for the 2.1 million federal civilian employees to the average compensation for the nation’s 114 million private sector workers. 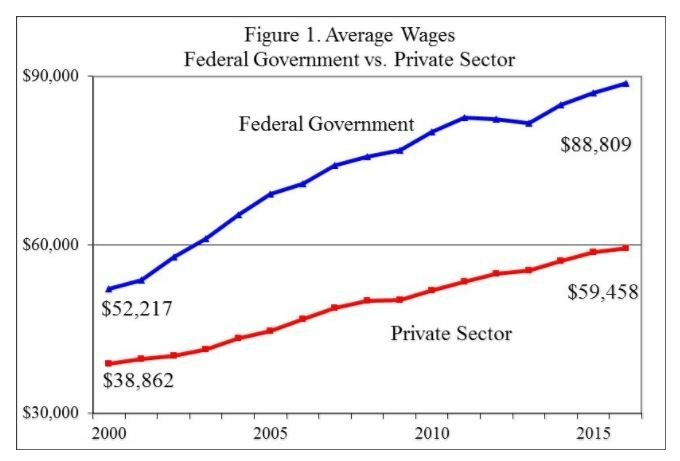 The federal average, according to Edwards, has grown significantly higher than the private sector in the past 15 years. Adding benefits such as health care and retirement, federal employees have a higher advantage than private sector workers. 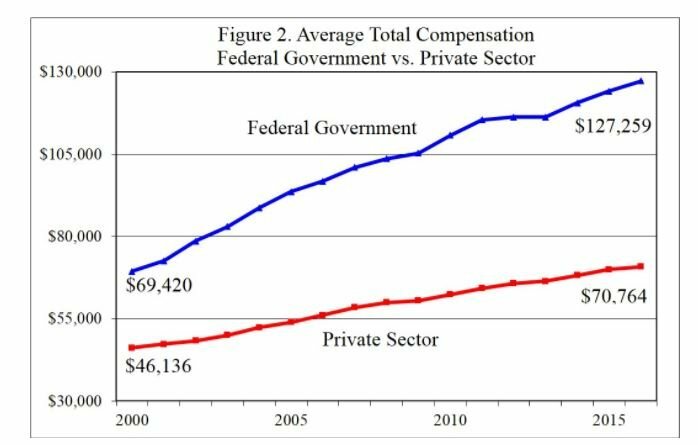 Average federal compensation reached $127, 259 in 2016, while private sector averages topped out at $70,764 — or $56, 495 lower. Cato’s latest study comes as some lawmakers have suggested they’re determined to make major changes to federal pay and benefits. But federal employee groups, unions and some lawmakers argue these comparisons are a pointless exercise. They point to other studies on the topic that show vastly different results and say the federal government should serve as a model employer to recruit and retain top talent. How fair are reports like this? Let us know. Take our anonymous online survey. These federal employee groups, unions and lawmakers often play an important political role in boosting employee pay, Edwards argued. The Cato Institute’s report also comes months after the Congressional Budget Office conducted a similar study. According to CBO, government spends 17 percent more compensating its employees compared to the private sector. The disparities grow, however, depending on the employee’s level of educational attainment. In total, federal employees with a high school diploma or less earn on average 53 percent more than their counterparts in the private sector, while federal workers with a bachelor’s degree received 21 percent more in compensation. In contrast, total compensation costs for employees with a professional degree or doctorate were 18 percent lower than workers in the private sector, CBO said. Edwards acknowledged pay disparities based on experience and education. 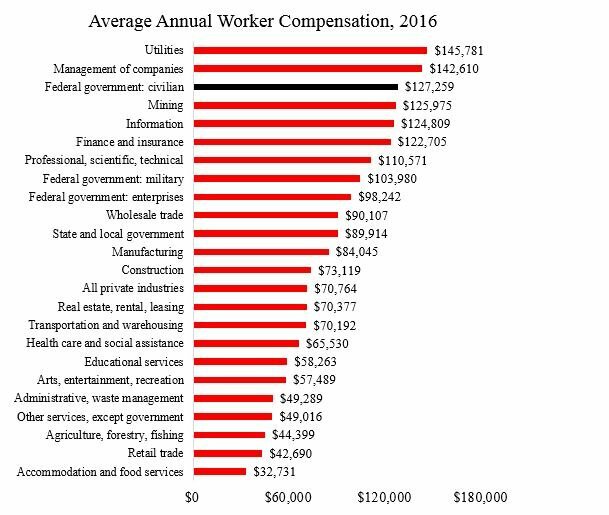 Again according to the BEA data, the average annual federal civilian employee compensation sits third on a list of 24 major industries. Only employees in utilities and the “management of companies” earn more per year than federal workers, Edwards said. But Edwards did not, for example, specifically compare whether federal IT professionals earned more or less than their counterparts in IT or cybersecurity positions in the private sector. Other think tanks have also looked at this topic, often choosing to include different measures or use slightly different data to reach their conclusions. The Heritage Foundation, for example, found federal pay 22 percent higher than private sector wages, according to a 2016 report. The American Enterprise Institute in 2011 said federal pay is about 14 percent higher, on average, than private sector wages. The Bureau of Labor Statistics and Office of Personnel Management annually compare federal pay with the private sector. Federal employees, on average, earn about 34.07 percent less than their counterparts in the private sector, according to their latest calculation. BLS and OPM use data from the National Compensation Survey and the Occupational Employment Statistics program to calculate their version of the pay gap between the public and private sectors. This calculation only compares pay, not the total compensation and benefits that workers receive. The Federal Salary Council uses this comparison to calculate locality pay rates for federal employees in various locations across the country. Congress passed a law in the 1990s that was designed to eliminate the pay gap — using Salary Council calculations — between public and private sector workers, but lawmakers have never set aside enough funding to do that. A partial freeze on wages, as President Barack Obama authorized between 2011 and 2013, along with significant changes to the federal retirement system, would help lower the disparity between public and private sector compensation, Edwards said. Specifically, Congress should end the defined benefit pension plan for federal employees and privatize some public sector jobs, including postal workers, air traffic controllers and Amtrak employees.